The Lehigh Valley wants LeBron, and the IronPigs are pulling out all the stops to make it happen. 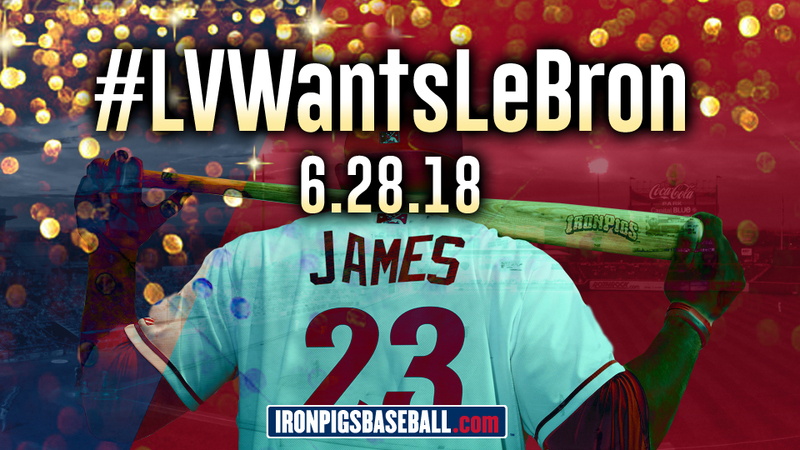 The Lehigh Valley IronPigs have scheduled #LVWantsLeBron Night for Thursday, June 28 to make a last-minute pitch to four-time NBA MVP LeBron James before he enters free agency. Ahead of the evening's 7:05 p.m. contest against the Scranton/Wilkes-Barre RailRiders, 1,500 guests 18-and-older will receive LeBron James masks while 1,500 guests 17-and-younger will receive headbands similar to the ones James wore early in his NBA career. The night will also feature a number of basketball- and LeBron James-themed activities including a chalk toss, special LeBron fan cam, merchandise, and a free fountain Sprite for anyone who comes to the ballpark wearing a LeBron James jersey. While he didn't grow up playing baseball like Michael Jordan, James donned a cap and cleats under the moniker "The Big Taste" this season in a promotional campaign for Sprite. The Pigs hope that experience translates to the diamond at Coca-Cola Park. They have extended an invitation to the soon-to-be GOAT and hope he's able to attend the festivities before signing his contract to play for the IronPigs. #LVWantsLeBron Night will be the culmination of two months of recruitment. Earlier in May, the team purchased a billboard on American Parkway introducing their campaign to bring the future hall-of-famer to the Lehigh Valley. They followed it with an open letter to James stating that "a season of mediocre play in Minor League Baseball" is all that is keeping James from overtaking Jordan as the greatest of all-time. That introduction of the recruitment, which went viral on social media, was just the beginning. The team continued by customizing an IronPigs jersey with James' name and number then mailed it to Cleveland. More recruitment activities are planned in the weeks leading up to #LVWantsLeBron Night. The team is asking fans and local businesses to join in on the recruitment by posting videos pitches for James using #LVWantsLeBron. James won't be the only one signing with the IronPigs this summer. Current Bacon, USA, full-season members will be able to sign on for 2019 starting on #LVWantsLeBron Night. Anyone with IronPigs season tickets will be able to secure their seats for another exciting season at Coca-Cola Park. Fans with 35- or 17-game plans will be able to renew for 2019 starting July 6 and July 12 respectively.